Movies have been a great source of entertainment for us for a long time. It’s been more than a century since the first movie theatre came out and since then, people have been visiting movie theatres and enjoying their time with their family and friends. Times have changed and now technology has made our lives so much easier. It has also given us the opportunity to have a movie theatre at home which we call a home theatre. 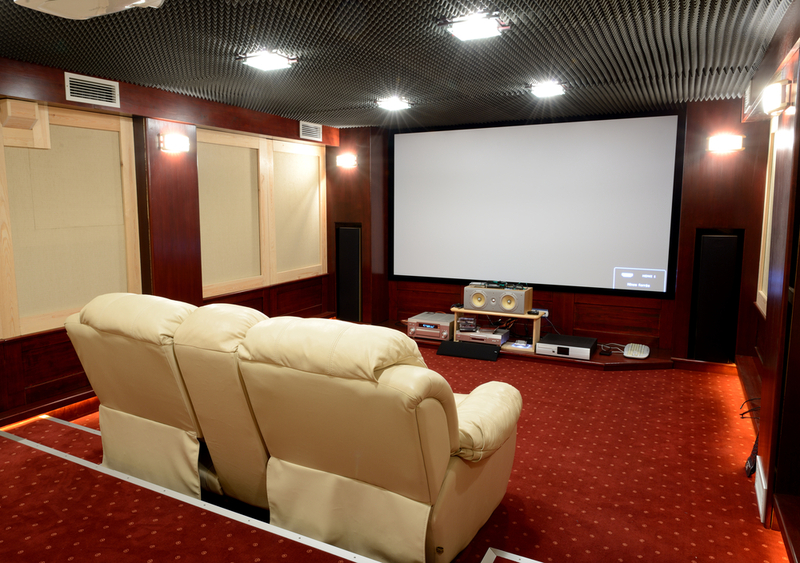 Here are some exciting ideas about how you can have your own home theatre. Some people prefer to have a darker environment while they watch movies, just like the theatres. In this case, the walls on the inside of the home theatre room can be designed and then supporting lights can be put on the back to have an illuminating effect in the room. Comfortable couches can be put at the proper viewing distance depending on the screen size. On the other hand, people who prefer day mode can have spotlights on the ceiling of the room and a warm coloured rug on the floor complimented by a bright coloured sofa set. The walls can be set to a wooden texture for an overall warm feel. In this interesting set-up, the seating arrangement is done along the three sides, with a table at the centre for having refreshments. This type of seating arrangement allows the spectators to talk to each other and also have a group feeling. The walls may be covered by a curtain if it has a window. The colour setting can be set to mid tones for a balanced ambience. This is a more dark kind of room. The walls are designed with dark colours, maybe diamond plates and bolted steel sheets. Gives the interior a sort of industrial vibe. The total number of lights are kept to a minimum. There is a main Omni spotlight. The seats are beige, which can also be recliners. A carpet can cover the whole floor, preferably a bit of a lighter tone, like lavender or Prussian blue. This will create the whole environment. This follows a bit more theatrical structure of row wise couches, the rear rows are put at a slightly higher height than that of the immediate front row. There can be about three rows in a medium sized room. It is an all-white coloured setting with ceiling borders and white lights on its inner beam side to reflect light off the top. There can be a few spotlights as per preference. The speakers are on the two sides of the big TV screen for a perfect theatre feel. This is a totally unique idea. The walls are decorated in a way that the whole room feels like a cave. The inner walls are designed with stone like finishing with hardboard and other materials. There are solid wood beams fitting like a frame which looks like the insides of a mine. Lantern shaped lights are hanged on the beams and a stone coloured couch is arranged to complement the setting. Previous PostHow to Set Up A Home OfficeNext PostWhy are TV antennas making a comeback?